Artists Talk: 25 Jan, 2 - 3pm; gallery opening hours: Tuesday - Sunday, 10am - 5pm. Another Country is an exhibition of new paintings by Matthew Krishanu and Cara Nahaul that explore contrasting notions of familiarity and strangeness. 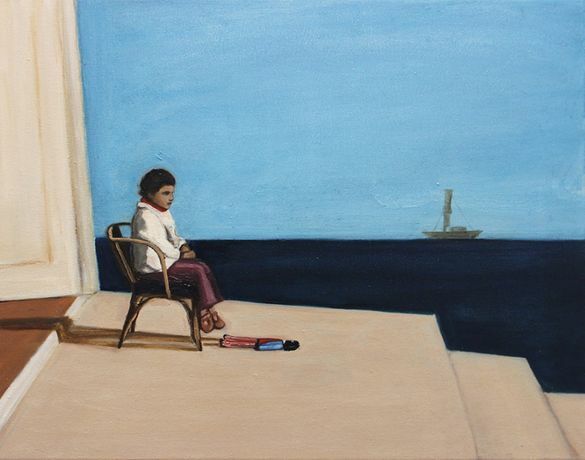 Opening at the Nunnery Gallery in January 2014, the show presents two different approaches to painting that look at themes of travel, dislocation and memory. Matthew Krishanu creates paintings from memory and photographs ? re-imagining scenes through editing, simplifying and layering. He is interested in how painting history (whether personal or global) involves constructing narratives and compositions that might either draw in the viewer or keep them at bay. Cara Nahaul?s paintings investigate representation and performance. Using archival family photographs as reference points, Nahaul places props and objects within imagined interiors. She uses the absence of the figure to reflect on subjectivity and ideas around performing the self.